The halfway house offers Sebastian Gorka and other former Trump staffers the chance to unlearn some of the destructive behavior patterns acquired in the administration and gradually transition back into the community. The 20-bed residential treatment center, which opened earlier this year in the capital’s quiet Woodland Park neighborhood, reportedly offers round-the-clock care to traumatized former West Wing insiders, providing life skills training, wellness workshops, and psychotherapy under the guidance of licensed social workers. “It’s very lucky we were able to accommodate him, though, as we’ve been completely full since February,” he added. According to Woodley, once accepted to the program, a jittery, confused Gorka was driven from the White House directly to the facility to begin treatment. During the intake process, Gorka’s personal belongings were reportedly confiscated and he was asked to sign forms promising not to visit the Oval Office or have any contact with his enabling friends still within the administration. Sources said that Gorka, 46, has responded well to the facility’s regimented schedule, rising before dawn to brew coffee and make breakfast for the group with former communications director Michael Dubke. 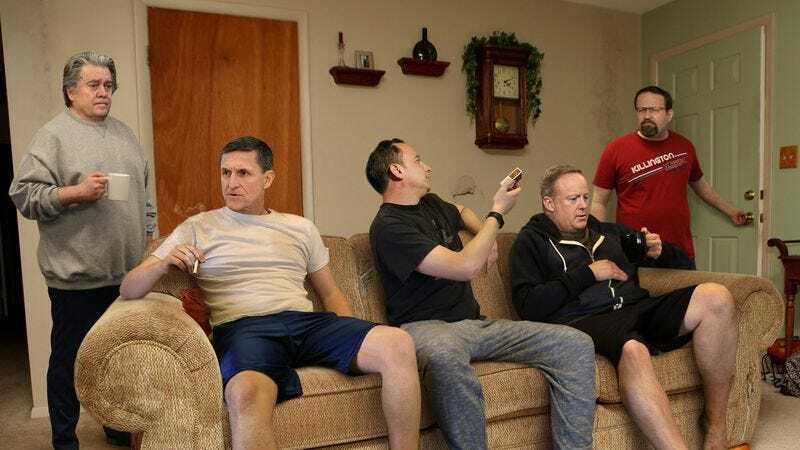 Additionally, sources noted that Gorka had bonded with long-term resident Lt. Gen. Michael Flynn, who showed him how to do his own laundry and helped him buy a bus pass so he could apply for dishwashing jobs around town. “Yes, it’s true these guys got wrapped up with the wrong people, but I firmly believe everyone has value no matter badly they’ve screwed up their lives, or their family’s lives, or the lives of 314 million Americans,” he continued. According to Woodley, some of the biggest breakthroughs are made during group therapy where twice a day, former officials gather in the facility’s activity room to discuss tense moments working for the administration and how they might have handled them differently. He noted that while some residents reportedly take weeks to admit the things they’ve done, most eventually build up the courage to share their stories, often breaking down into sobs. Woodley also explained that all residents are required to follow a strict code of conduct: no drugs or alcohol, no guest appearances on cable news, and a tidy bunk at all times. According to staff, however, abiding by the rules has been especially tough for Steve Bannon, whose attempts to conduct Breitbart editorial meetings via a smuggled cell phone have led to his loss of commissary privileges. While rehabilitation has been easier for some residents than others, Woodley said former White House communications director Anthony Scaramucci was his biggest success story to date, noting that, after several weeks of intense rage counseling, he had fully accepted responsibility for his chaotic 10-day tenure and would soon be starting a new job at an Arlington landscaping company.